foals! This mare undoubtedly has been a blessing to our farm and program. Hopkins Billion Dollar Gal – 2010 Mare – SOLD as a weanling! 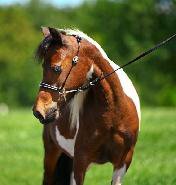 Hopkins the Joker March Iz On – 2012 Mare – retaining for our breeding program. Hopkins The Joker in January (aka JJ) – 2013 Mare – SOLD as a weanling! Hopkins the Jokers Jezabel – 2015 Mare – Show Filly, being retained.